From the moment Heidi and Eric started dating, they knew they wanted to adopt a dog together. After get ting married and moving a thousand miles to Los Angeles, they began looking for that special someone. They fell in love with dog after dog on shelter websites, only to find out they had already been adopted. Finally, they found Freckles at Inland Valley Humane Society. When they went to see him, he was playing happily in the kennel he shared with several other dogs. 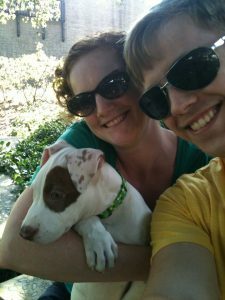 When Heidi and Eric learned that he was a pit bull puppy, they were wary. Weren’t pit bulls mean? 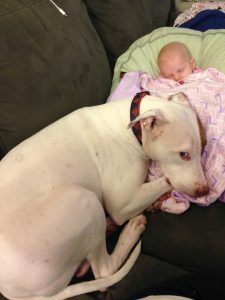 They knew they wanted to have a family one day, and pit bulls couldn’t be trusted around kids, right? His happy-go-lucky attitude and his adorable face sealed the deal – but they were hesitant. And they had to wait – another family had put a hold on Freckles. Heidi and Eric waited (im)patiently for the hold time to expire. At 5 pm on the expiration date, they were told the happy news – they could come get him the next day! (Also, how on EARTH did that other family turn down that face?!?). Freckles joined his new family and was renamed Samson. Samson had a bit of a rough start in life. Though the shelter knew that he was young, they weren’t sure exactly how old he was. He was found wandering the parking lot at a grocery store. They estimated his age at 12 weeks, but it was later adjusted to only 8 weeks old. This was AFTER the 2 week hold policy at the shelter, which means he was separated from his litter at 6 weeks or even earlier! Then, five days after coming home with Heidi and Eric, he began showing signs of illness. A rushed trip to the vet confirmed he had Parvo. For the next six days, Heidi and Eric anxiously administered medic ine at home, including shots and IV drip. It was so heartbreaking to watch helplessly as this 18-lb ball of love struggled to survive. But survive he did! Soon enough, he was leaping over the baby gate Heidi and Eric had installed to keep him off the carpet. As he grew, Samson broke down all sorts of walls (including an actual wall, while playing ball in the house!). He had already stolen their hearts, and immediately set out to steal the couch and the bed as well. (Heidi and Eric remember back when there was a “no dogs on the couch” and “no dogs on the bed” rule – ha!). But the biggest wall that Samson broke down was the image of the breed that Heidi and Eric had. Before even bringing him home from the shelter, they began researching pit bulls. 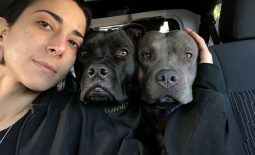 They quickly found that people on the Internet either love or hate pit bulls – there is no middle ground. And usually those who hate them have never actually met one. Better sources were needed, so Heidi read “The Pit Bull Placebo,” an e-book about skewed media coverage of various dog breeds over the years, most specifically pit bulls. It explained how this amazing group of dogs (not a single breed) undeservedly got this terrible reputation, and how the Internet aids in the spread of misinformation. Heidi was a convert, and Eric didn’t need any convincing other than the sweet puppy face snuggled up next to him. Meanwhile, Samson began training classes (after he was cleared from the vet from Parvo, of course). Heidi and Eric tried three different places before finding LARPBO, and at each class, the trainer s had the attitude of “Well, he’s a pit bull. 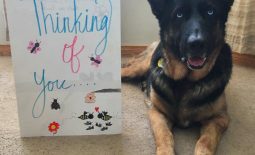 There’s only so much you can train out of a dog like that.” And this, even though he was the fastest to learn new skills, loved everyone he met, and wasn’t afraid of anything! 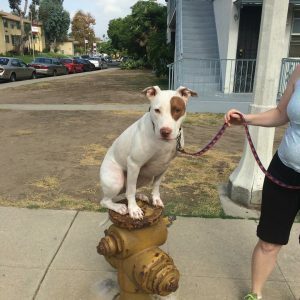 Finally, they read about something called “National Pit Bull Awareness Day,” and a local group (LARPBO) was holding an event at a park. Eric had to work, so Heidi brought Samson to the pack walk. She met Sammi and her totally chill dog Makana. She learned about yellow ribbons, which Samson needed because he played too rough with other dogs and didn’t read their signals very well. When she had to run to the bathroom, Mari and Griff were happy to watch Samson. Heidi and Eric slowly got more involved in the LARPBO community – first with swim classes and pack walks, then the online group, and finally in individual and group training. In private lessons with Sadot, Heidi and Eric learned how to use an e-collar as a training tool (and Heidi overcame her fear of it too). Though Samson had earned his Canine Good Citizen certification with a previous trainer, he was now a teenager and needed … some reminding. He fine-tuned skills like heel and long-range stay, and he learned fun tricks like how to place on a fire hydrant – a feat that is literally traffic-stopping. And eventually, as they had hoped, Heidi and Eric began their two-legged family. Emilia was born in February 2016, and Samson is the best big brother a girl could ask for.When she cries, he licks her face. If Heidi and Eric aren’t responding to her fast enough, he goes and gets them. He snuggles next to her when she’s nursing. He is gentle and patient while she learns how to pet him safely. And though Heidi and Eric know not to leave ANY dog alone with ANY child, Samson has taught them that his breed has absolutely NOTHING to do with his temperament. Now, Emilia is already becoming an advocate for her brother’s breed by attending adoption events. 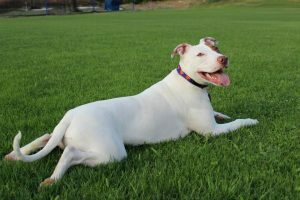 She is showing potential adopters that pit bulls can be the most amazing fur-siblings to children of any age. To join our classes or free pack walks, visit Meetup. These stories illustrates LARPBO’s part in keeping dogs home and out of shelters AND guiding owners to help dogs reach their potential. Please help us continue making a difference in the community. Click here to support TEAM LARPBO by donating to our October 2018 Race for the Rescues goal. Donations benefit LARPBO, as well as various shelters and rescue organizations. Cali: It’s All About Cali! Frannie: How Did this Happen? 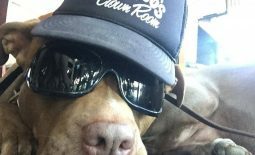 Miles Woo: So You Think My Dog is Good?